Bob Cronin, aka dj BC, is best known as the creator of such memorable mash-ups as The Beastles (Beatles vs. Beastie Boys) and Wu Orleans (Wu-Tang Clan vs. New Orleans Jazz). Boston Phoenix magazine declared him Boston's Best Lawbreaker, and his progressive attitude towards copyrights might also be responsible for the fact that his mixes usually disappear from his website after a relatively short time. 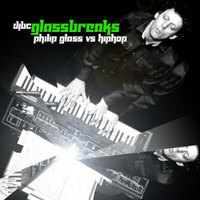 One of my all-time dj BC favorites is his album Glassbreaks, mashing up Philip Glass with hip-hop. Here it is, for free download, and hopefully for a longer time. By the way, "PG" is short for Philip Glass, not to be confused with the MPAA content rating acronym. Tracks 2-8 are in fact rated R and may damage unaccompanied minors. This album punches that joke the hell out. This is one of the coolest things I've ever heard. Master of the genre. Great great great job! Does anybody know if Glass knows about it? I hear he's pretty cool about things like this. He might like it. This album is absolute class! An instrumental version would be more my style though. Well done to DJBC. A well polished production. an instrumental version would be sweet!